April in Montana. Everybody gets excited when it hits 60 degrees, but nobody puts their jackets away. Parts of the state saw 70 degrees last week, but Saturday on the river found me knee-deep in water squinting through the snowflakes stinging my eyes. It was a brutal day weather-wise. It was 40 at dawn, the high for the day. Not bad really, but it was windy, rainy, and snowy all day. By the time I got back to the truck ten hours later it was hovering just above 30. Most every part of me was numb, but well worth it (although a few folks have been known to call me crazy). These can be the best days. The action might not always be hot, but the fish are quality. 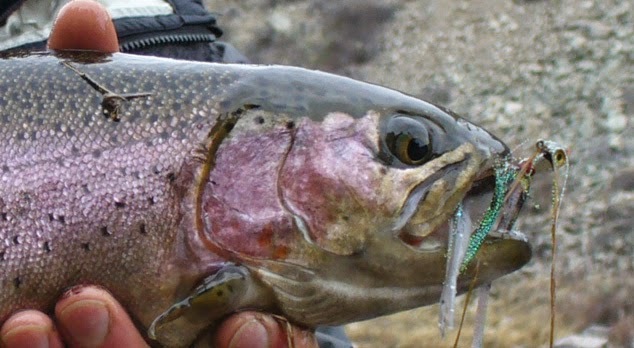 Big rainbows are stirring as spawning urges them out of the depths. Higher water flows get the browns motivated to cruise the eddies and stake out ambush points. Sometimes the action is only limited by the fisherman's ability to function in the frigid, ever-changing conditions. I like days like Saturday. Only the serious folks are out, but the fishing is unaffected by the time of day. On the Missouri, if it weren't for the tailwater aspect, there'd be no fishing right now. The upper river is blown out by snowmelt. In response, the lower river is flowing at rates double its typical stage, but the water remains clear. Streamside trails and access points are drowned under a couple feet of water. Wading remains essential for getting around obstacles and stepping out onto the occasional strategic boulder, although wade-fishing is mostly not an option. caught several other solid rainbows throughout the morning and into the afternoon. Many on plugs, but most on jigs. By about 2 o'clock I came to a particularly rocky shoreline framed by high bluffs. Anyone who knows browns knows that they are likely to be caught anywhere, but they also know that quite often browns orient off a particular structure or stretch of water. Especially if their population isn't the dominant fish in the stream - then they really tend to just occupy whatever their favorite parts of water are, much like a bass. When you find these spots, you can often return to them time and again and expect the same results. The same is true of smallmouth bass in rivers -once you've identified a piece of water that holds them, you can almost always find them there. This rocky stretch was on the outside of a bend, and the swollen river was slamming into this bank. An astute observer of my photos once pointed out to me that I often fish steep rocky edges. It's true, even in smaller streams. Often at the point where a fisherman typically crosses over to fish from the inside of the bend, I stay on the outside, and precariously pick my way along the edges, thoroughly working the deep pockets that are nearly impossible to keep a lure or fly in from the other side. I do the same thing when steelhead fishing. Poise yourself over the water in the best way possible for keeping your lure or bait in place the longest. Casting over the current from the "convenient" side often means that your presentation will fall out of the productive holding water sooner than it should have. Once you've hooked up, finding a place to land your catch can be the real adventure - but at least you hooked up! My big rainbow to start the day was in just such a spot. I descended steep rocks just to reach one eddy. 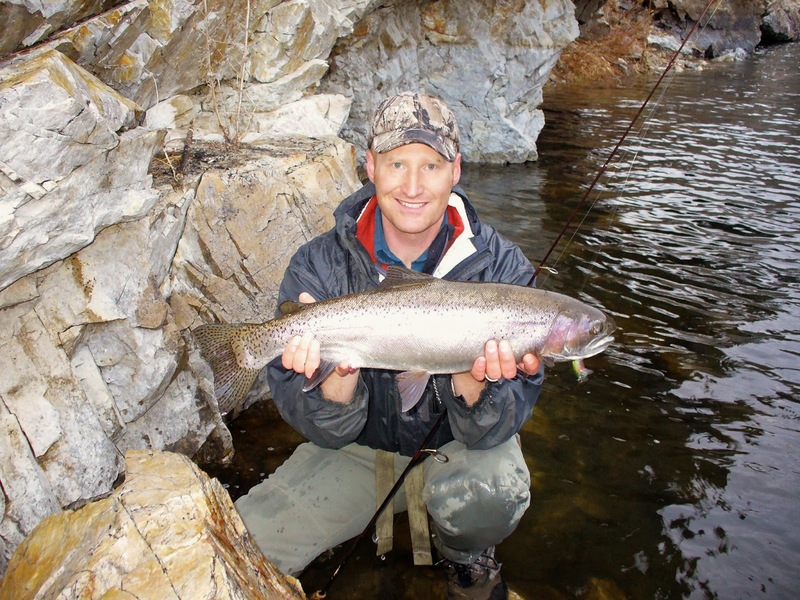 The result was a photo op that looked more like I was posing with a Coho salmon than a Montana rainbow. switched lures between each cast, always giving him something different to look at. I don't know why I was unable to connect with such an aggressive fish, but it wasn't to be, and I moved on. I had a few chasers and a few followers, each one a brown. By the end of the rocky stretch I'd landed only half a dozen, but two were fish exceeding 20 inches. Both nailed a Zoom Tiny Fluke in Arkansas Shiner fished on an 1/8th ounce jig head. A couple other smaller ones came on 1/8th ounce Glass Minnows from Kit's Tackle, also sporting a Tiny Fluke on the shank. Unfortunately my camera batteries, including my spares, died. I guess they'd been through too many freezings and thawings on my recent trips to the river. I took a couple mediocre cell phone shots on an outstretched arm and one segment of video. Normally I reach back behind me and set up a camera attached to a small tripod to capture a self portrait as I raise the fish out of the water for a pic. It still pains me to think of the fish I released that afternoon without a decent picture. By the time I reached the end of the rocky stretch and the river was straightening out again, I knew I was nearing the time to hike out. But, still casting the Tiny Fluke up against the bank on a straight downstream presentation, the river had one more pig to part with before I left. My last fish of the day was a beast of a rainbow that went 6.5 pounds on my pocket scale. Both my first and last fish of the day were trophy rainbows. I'll take that. And I was more than happy to start walking the distance back to where I'd parked to try and get my body temperature back up to human levels. My wife and I went to dinner with some friends that evening. After hearing a few details of my long cold day in the pursuit of fish, the lady of the couple across the table quite witfully said, "This isn't the dinner date you think it its, this is an intervention." And apparently it didn't work!!! ;) And thank you for noticing my charming wit. Yes. I'm taking it as a compliment. No smarty-pants sarcasm here. Just delightful, charming wit. Keep fishing. And blogging. It's great!